This is the personal page of 79RC003. this is all about my activities on 11 meter DX. I hope you enjoy reading and please feel free to comment on my postings. 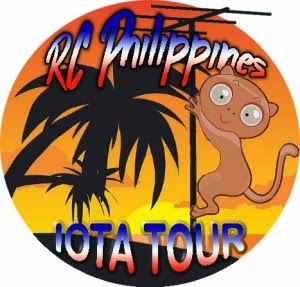 Just to let you all know, we will be starting the 79RC IOTA Tour this December the 15th we have stations operating from the 3 Major Islands of the Philippines OC-042, OC-129, and OC-130 (Luzon, Visayas and Mindanao). Our goal in this activation is to let everyone know that 79 division is again active on 11 meters and shall remain active from now on. I hope this would be a productive and successful endeavor. Rules are available on the RC website. just click the link. 79 operators are looking forward to make contact with all of you ! 79RC003 will be active from end of June 2013. I will be on air and hope to make many contacts soon. Also, there has been more additions to the Romeo Charlie group in the Philippines. Recently, we added Bong 79RC168 and Achilles 79RC027. I hope you also make contacts with these operators. I also have a Facebook page. please visit and like https://www.facebook.com/79rc003. 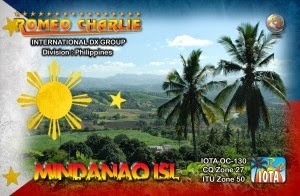 We also launched recently The Romeo Charlie International DX Group on face book. feel free to post anything there, information on activations, DX spots, expeditions and special events you may have. Please visit us at https://www.facebook.com/groups/rc79division/. thanks and hope to have QSO with you soon! 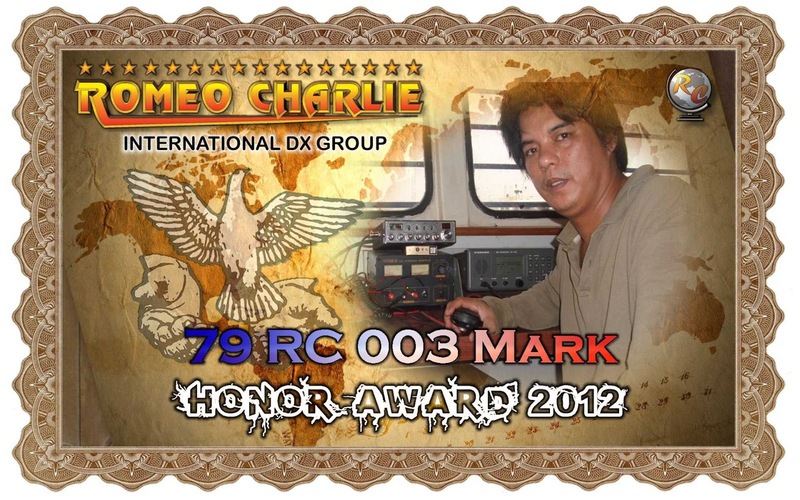 It is with great pride for me to receive this award from the Romeo Charlie International DX Group HQ. The group HQ has selected Operators from all over the world to receive this and I am honored to be chosen among the 5. I wish to thank my QSLM for the huge support and I will keep on being an active member of the group. I hope I get gold next year! Watch out for these callsigns as they will be making noise on 555 soon! Goodluck and good DX guys! Propagation on 79 division has been very poor since June. All I hear are stations from 153, 91, 25, and some local operators. Not too much activity on my part. Since prop has been that bad, I am working on 40M and 2 M daily. local qso. I recently rx'ed qsl cards from station I contacted last May here on 79. I will be posting the cards soon. anyway, I hope propagations improve soon. I will be off to work again and I might be inactive since I might not be going to 89 Division. I received a nasty email from this operator. he called me a "little bandit" because i was not able to send him a post card for his wife direct from 89. he did however rx my qsl card direct from 89. I sent him an envelope without asking for any contribution. 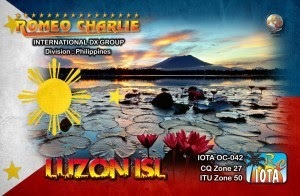 just like I did with other operators i who received qsl direct from 89 outside Romeo Charlie QSL Management. in my effort to please this guy, I promised to send him the postcard sometime later as soon as possible. I guess he couldn't wait and just send the email calling me a "LITTLE BANDIT". This is a notice for all of you that 47PL122 does not care of security issues in some divisions. all he cares is getting QSL and Post card direct. He does not have any respect for QSL Managers because he insists on getting QSL's direct from contacts. I am very disappointed by his behavior and I resent him calling me a bandit since I never asked for any contribution from him. I spent my own money on the card I designed and made myself and went to the post office to mail it myself despite security risks that may arise. He is the person who benefited for all the trouble i went through and he has the gall to call me a bandit? what a clown. I hope operators who read this will keep away from 47PL122. he is not an operator i wish to qso with again. Now that I am back in 79 Div., I m active daily on t5. my qsl manager is still Stephane. I am using a 100 watt transceiver with a vertical antenna. my 4 el yagi is still under works and hopefully will be ready soon. Looking forward to contacts soon on the air. 89RC0 Official Page. Awesome Inc. theme. Theme images by Dizzo. Powered by Blogger.